Areas in Green and Red will walk to the spectator area. Parking in the Blue area will take a shuttle. Q: What time do parking areas and gates open? Q: What can I expect in preparation for parking? A: Parking is a challenge at all air shows but to help make the experience the best it can be, our tickets will guide you to your assigned parking area. Parking tickets are good for ONE DAY ONLY. Please make sure you purchase parking for the correct day. 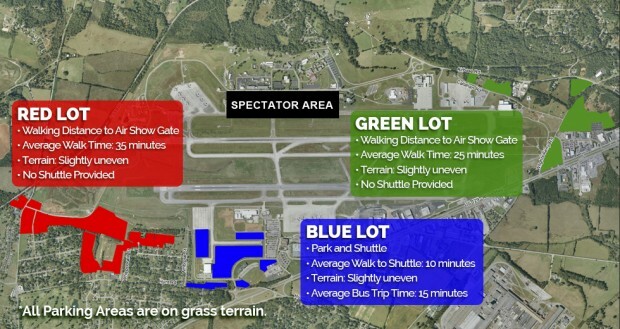 Please visit SmokyMountainAirShow.com for additional parking details. Q: Are kids admitted free or at a reduced price? A: General Admission to the air show is FREE with the purchase of a parking pass. There is a fee for parking passes and a portion of the proceeds benefit Honor Air Knoxville. Q: What items are not allowed at the show? A: Please visit SmokyMountainAirShow.com for a full list of prohibited items. A: ALL SALES ARE FINAL. NO REFUNDS. NO EXCHANGES. Q. What handicap parking options are available? Q. What is included in the Early Bird Photography Pass?